My friend Pam died today. It still doesn't feel quite real to say that, even though we've known this day was approaching. She had been fighting cancer for a long time. Pam wrote magic haiku - which she often put with photos or images she, or friends, had taken or created. Black Wood Jazz gatherings have been enhanced by Pam's poetry and images. My Christmases, 30th birthday, last Black Wood Jazz gathering, and the passing of my grandmother have all been marked by Pam with haiku and images. For better, or perhaps worse, I marked this moment with a haiku. goodbye dear friend, may there be deep peace for you now in the fullness of the Divine presence. have you ever wanted more than just one Sunday morning to explore the story of Pentecost? have you ever wondered about the story of Jesus' ascension into the heavenly realm? take time with The Esther Project to encounter these stories of mystery and wonder, of visions and dreams, of Spirit and flesh and God present in remarkable ways. 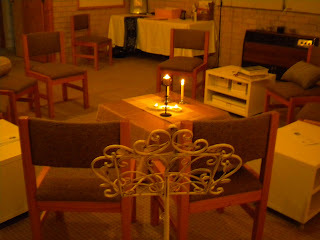 This Monday The Esther Project worship space centres on stories of voicelessness and restoration of voice. It will be disturbing, it will be hopeful. There will be silence, there will be singing. We hope to meet you in there in the story. This is video from Jonny Baker of the walk through the Landscape of Desire installation I was involved with for the Fringe Festival in March. Check it out. This last week I have had a lot of fun giving shape to a vision that was born out of various conversations within the Esther Project. We have been frustrated at the amount of time it takes to set the space each time we gather, with a lot of the materials needing to be transported from my home to the church and back again, and wondered if there was a way we could set a slightly more permanent space for our community. The underlying question here is sustainability for the community and its leaders, being as it is still a small collective of people, who are all engaged in many other projects between us. Another issue is the way we are able to welcome newcomers to a community that now knows its identity and is feeling somewhat more stable and established, and this space reflects this movement for the Esther Project.